By now I’m sure you all know I’m on a Relay for Life team this year. For those of you that don’t, Relay for Life is an event created by the American Cancer Society geared towards raising hope, awareness, and funds for cancer research, patients, caregivers, and survivors. As a caregiver, I have seen cancer second-hand. My mother, Linda Myers, is a two-time cancer survivor and a personal hero of mine. When she was diagnosed the first time, I was a freshman in high school, and we immediately determined we would not only fight this thing together, but we would join the fight to help others by supporting the ACS and participate in our first Relay for Life together. As head of the survivorship committee and the leader of many teams, my mother has been an inspiration to many and helped so many people through their struggles with cancer. She truly is an amazing individual. She is the reason I relay. Now through April 29th, I’ll be continuing to take donations to reach my goal of $1000. I started out this year’s Relay with a goal of $500, which, with the help of the amazing staff and customers at QE, I was able to raise in just ONE DAY! I have since doubled my goal to $1000, and I am looking forward to exceeding that goal as well! I’m asking as a friend, as a caregiver, and as a family member for you to dig deep and give what you can. I’m a proud supporter of the ACS and the fight for more birthdays. 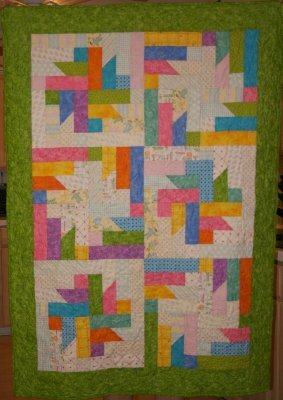 I will also be taking donations at QE and selling opportunity tickets for the beautiful Spinning Wheels quilt Karen Humphrey (our team leader) machine pieced and quilted. Opportunity tickets are one for $1 or six for $5. Second prize is a limited edition Breast Cancer Awareness Scentsy burner.